Live a bit of French History and stay in 'La Citadine', an Historic Townhouse on the Place Richelieu, in the center of Old Town Amboise! From it's expansive top floor, flooded with light, you'll find amazing exposed beams, tall arched ceiling, a fully equipped kitchen, elegant dining area, comfy salon, and windows, windows, windows -- all with spectacular views of the Royal Palace of Amboise! La Citadine is 950 square feet, and occupies the 2 top floors of a three-story classic French Townhouse originally built in the 1500's! It was once a part of the bustling Place Richelieu along the Route to Chenonceau, the most famous of the Loire Valley 16th century Chateaux. The townhouse is historic, but has been lovingly renovated with all new electrical system, including convenient USB outlets throughout, new plumbing, lighting, modern bathrooms, kitchen, and even air-conditioning on the expansive top floor, with those views, and endless windows! After entering La Citadine from a private, back entry way, and you will be transported back to another time with its historic staircase, fireplace in the main bedroom, beautiful exposed beams, tall ceiling, and mix of historic features and modern/functional furnishings. The first floor (US 2nd) is where you'll find both bedrooms. 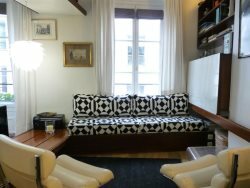 La Citadine has 2 large bedrooms, both with new, fully equipped ensuite bathrooms. Both bedrooms have new beds. The spacious main bedroom has a Queen, and it's large enough to have a sitting area with a double sized sofa bed (additional sleeping space if needed), and an amazing original fireplace. The second bedroom also has a queen bed, and another fully equipped, ensuite bathroom. The second floor (US 3rd) is where you'll find the fully equipped kitchen, complete with stove, oven, microwave, Nespresso machine, dishwasher, full sized clothes washer and dryer, and all you'll need to make gourmet meals from the fresh products found at Amboise's open market, and the specialty shops along the famous Rue Nationale. There's a large dining area, living area, with modern flat screen TV, and all those windows looking over the Place Richelieu, rooftops of Amboise, and the Royal Palace! This expansive living/dining/kitchen area is also air-conditioned. La Citadine is a three-minute walk from the Royal Palace and two minutes from the Rue Nationale, with its Clock Tower, clothing and antique shops, restaurants, wine tasting rooms, cheese shops, bakeries, bike rentals, etc. The popular Amboise Open Market, along the Loire River, is only a six-minute walk, as is the Chateau Clos Luce, the last home of Leonardo da Vinci, now a museum in his honor. Of course La Citadine is equipped with High-Speed Internet/Wifi, Cable TV, and a telephone that allows you to call Internationally for Free. *You might also ask us about renting a French phone chip, or French phone for use during your stay. After a day of visiting the quintessential Chateaux of the Loire Valley, you will have the pleasure of returning to your Amboise chez-vous. There is free parking on the Place Richelieu, and along the length of the street. There's also the large Chateau Parking lot, 2 blocks away, which is Free, and open 7/7, 24 hours a day. Live the life of French Gentry and stroll among the Amboisiens filling your basket with all the delights the Touraine has to offer. Then, return to La Citadine, your Amboise Townhouse, to prepare your meal and dine in the loft like upper floor, while admiring the Royal views of the Chateau d'Amboise! Or, you might decide to walk to the endless number of restaurants, bistros and cafés that line the Place du Chateau, the Rue Nationale, the Loire River or on the amazing island, Île d'Or, off the Amboise bridge in the middle of the Loire River. The owner gave us a ride to the train station because she was unable to connect to a taxi company to book a ride for us. This was much appreciated and ensured a stress-free end to our stay. We enjoyed our stay in this beautifully-restored, impeccably-clean, and well-location apartment.